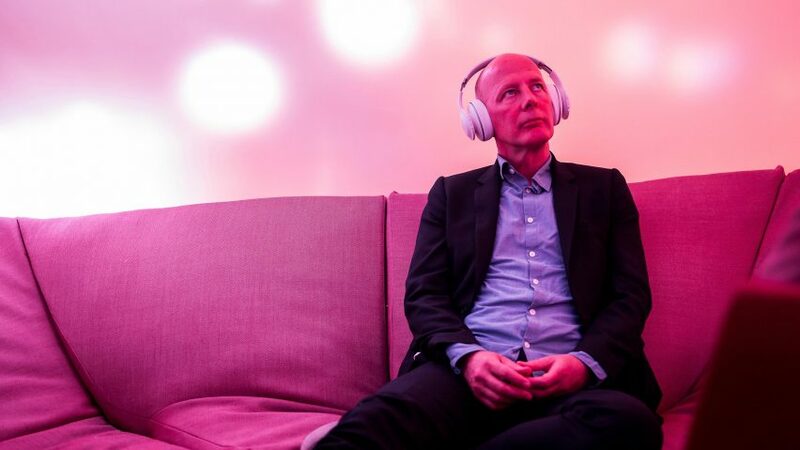 Secluded pods that allow office workers to meditate, smash things or scream will be commonplace in two years time says UNStudio founder Ben van Berkel, after research found that stress-related illness costs the US economy $300 billion a year. The Dutch architect claims that many big companies will install breakout pods in their workplaces in the near future to combat the "epidemic" levels of stress experienced by office workers all around the globe. "This is really an urgent topic," Van Berkel told Dezeen. "On a physical and an emotional level, we can reduce our stress." "We've talked to many companies about it," he continued. "I'm talking to one big tech company in Holland right now that are fascinated by this idea, because they have so many problems with stress in the workplace." To offer its own solution to the problem, UNStudio teamed up with social design agency Scape to design a series of pods that can be installed inside different types of office environment. But unlike similar products on the market, these modular units offer a variety of stress-reduction techniques. Occupants can engage in either active or passive activities, ranging from yoga to drumming or singing. One features walls that light up when touched. "We have introduced a stress-free zone where people can physically and emotionally reset themselves," said Van Berkel. The two studios presented prototypes of the Reset pods at Workplace 3.0, on show at the Salone del Mobile during Milan design week, as part of an exhibition called A Joyful Sense at Work. According to Scape founder Jeff Povlo, the financial cost of stress is going to force companies to start taking projects like Reset seriously – because the figures are just as worrying outside of the US. In Europe, work-related stress costs the EU approximately €20 billion (£17 billion) a year, while in Australia the annual cost is A$14.2 billion (£8.5 billion), according to Povlo's research. "When we started looking at the numbers, it was epidemic," he said. "So employees and employers really need to tackle this – just demanding more productivity isn't enough any more." Povlo claims these types of facilities will become a critical factor when companies are trying to retain talented staff, and will also help to ensure that these employees don't burn out. "There is a war for talent, so keeping and retaining talent is harder and harder," he explained. "Companies have to offer something more." "There's an urgency for this and I think that's only going to grow. Because right now we're not turning off, we're demanding more and the pace of our lives isn't slowing." Van Berkel and Povlo worked with scientists to add another feature to their Reset pods – a tracking system with biosensors, which scans a user's brain and offers real-time feedback about how it responded to different experiences. The pair believe this makes the pods even more attractive to companies, as they will be able to physically measure the impact they have made on the health of their staff – which in turn will lead to higher productivity. Van Berkel says he plans to install Reset pods in the UNStudio office as part of their latest refurbishment. "Some of my guys, and I have it sometimes too, sit too long behind the computer, especially when we do a competition, it's easily three hours or four hours non-stop," he said. "We could introduce something more to the effect that you stand up after two-and-a-half hours behind a computer, then maybe step into a pod. But we could also guide people to relax in other ways. This is just the beginning." Amsterdam-based UNStudio ranked at number 55 in the inaugural Dezeen Hot List – a countdown of the most newsworthy names in architecture and design. Many of the studio's projects introduce pioneering approaches to improving the social and physical health of occupants – from the sloping walkways of the curvaceous Arnhem station to the seamless network of spaces at the Singapore University of Technology and Design. Van Berkel stresses that there are many ways of adapting buildings to improve health. As part of an ongoing research project with Harvard, he has been exploring a variety of other areas that need significant improvement. "Architecture is going very slow, so I'm trying to push it," he added. "We have the possibility now to work artificial intelligence, virtual reality and more, we just need to integrate the right hardware and the software into the development of architecture."